Home / Stencil Ideas / Off the Wall / Fabric + Crafts / Top 6 Favorite DIY Stencil How To’s from 2014! 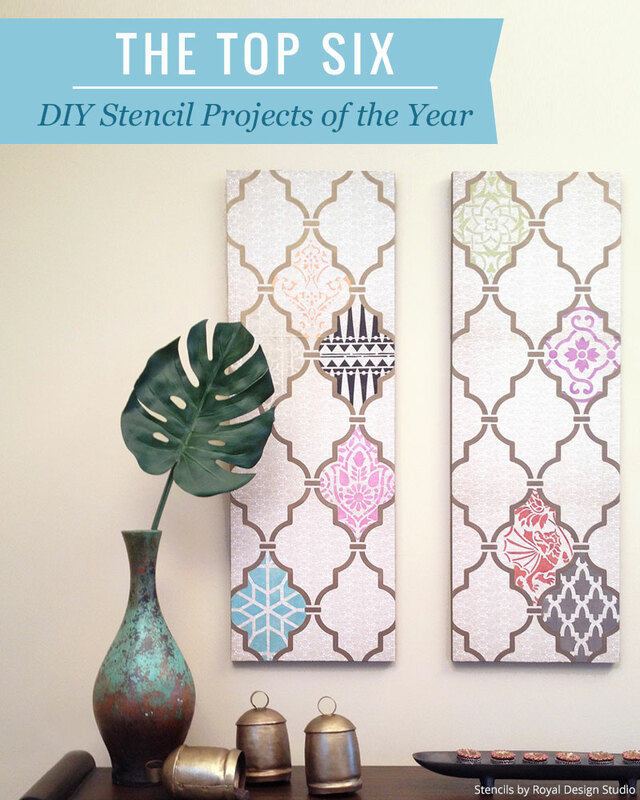 Top 6 Favorite DIY Stencil How To’s from 2014! The stencil patterns from your favorite How-To-Stencil projects of 2014 are on SALE! Recreate these popular DIYs with the coordinating stencils 20% off now through Thursday December 18, 2014! Shop our Stencils on Sale page now! It’s time to set goals for 2015! This year, instead of chasing unrealistic resolutions, we suggest that you try your hand at a creative DIY stencil project! Our how-to stencil instructions here on Paint + Pattern will show you how! Not only can you give your room a revamp, the best part is that you will feel a sense of accomplishment and have something new in your home that you can enjoy all year long! 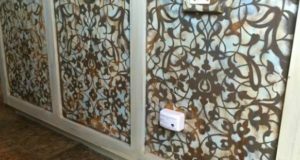 As we conclude our first year here at Paint + Pattern, it has been our pleasure to give you the inside scoop on all things stenciling with the goal of helping and inspiring you. Here are 2014’s top DIY stencil projects! Remember, the best thing about stenciling is its versatility! Change up the colors, patterns, and surfaces to match your style and space! So, get ready for the New Year, choose your favorite DIY, and start planning out your stenciling projects for 2015! 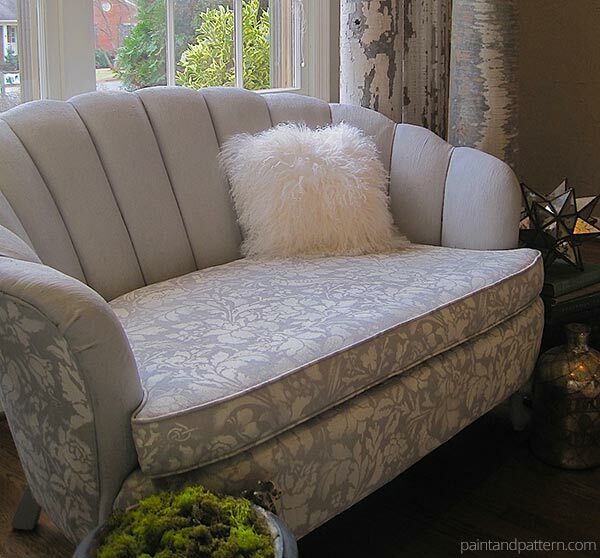 Our #1 stencil tutorial on Paint + Pattern is how to stencil upholstery with Chalk Paint® by Annie Sloan in Paris Grey and Old White and our French Floral Damask Stencil. Debbie Hayes of My Patch of Blue Sky shows you how to add romantic flower patterns to a dated upholstered sofa. 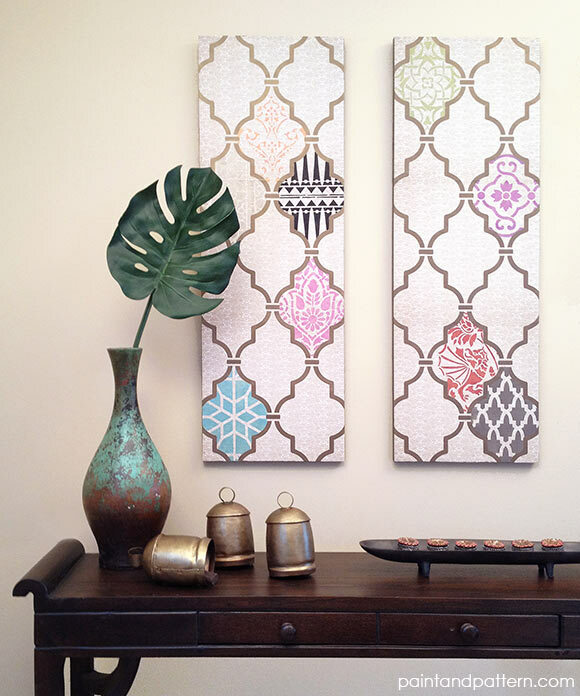 Deb, or Nomadic Decorator, walks us through an easy and inexpensive tutorial to create exotic wall décor using our Casablanca Trellis Moroccan Stencil. 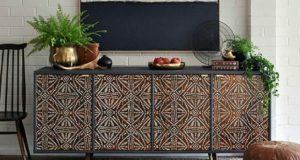 Because she incorporated so many of our Moroccan Stencils – our most popular stencil collection – we aren’t surprised it made the top DIY’s of the year! Deb of Nomadic Decorator also made our #3 spot. 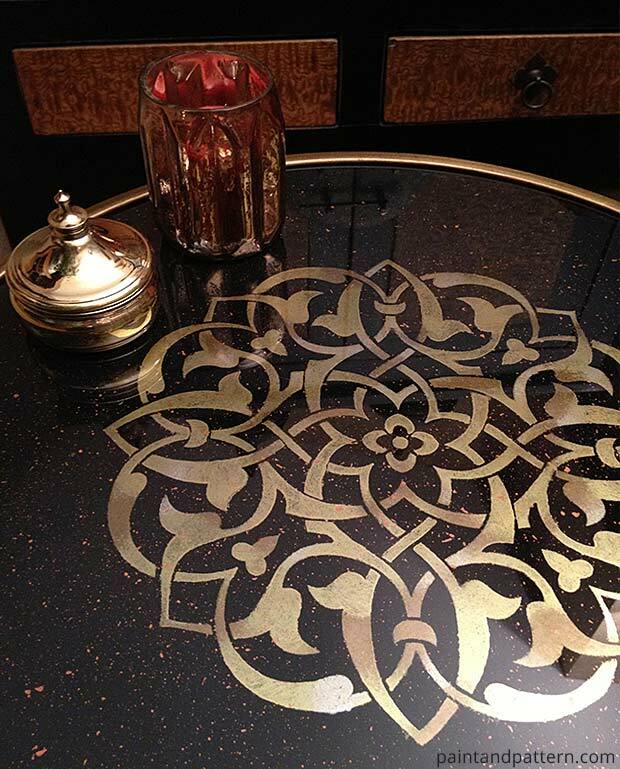 This time she guides you through the technique of reverse stenciling on glass using the underside of a glass cocktail table and our Marrakesh Medallion Stencil. Luxe for less has never been easier with the help of painting your layers of color in reverse – or, stenciling backwards. We stenciled a vinyl floorcloth using Chalk Paint® by Annie Sloan in Graphite, Old White, and Duck Egg Blue for a booth display. Because we got so many rave reviews, we had to share how easy it is to recreate it! 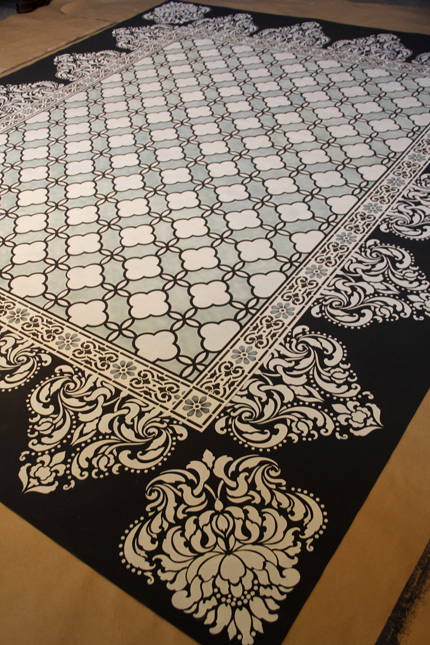 We used the Eastern Lattice Moroccan Stencil as the centerpiece and complementary patterns to create the border. You don’t have to go south of the border to bring home a colorful Mexican Talavera tile table with a fun, folk art flair! 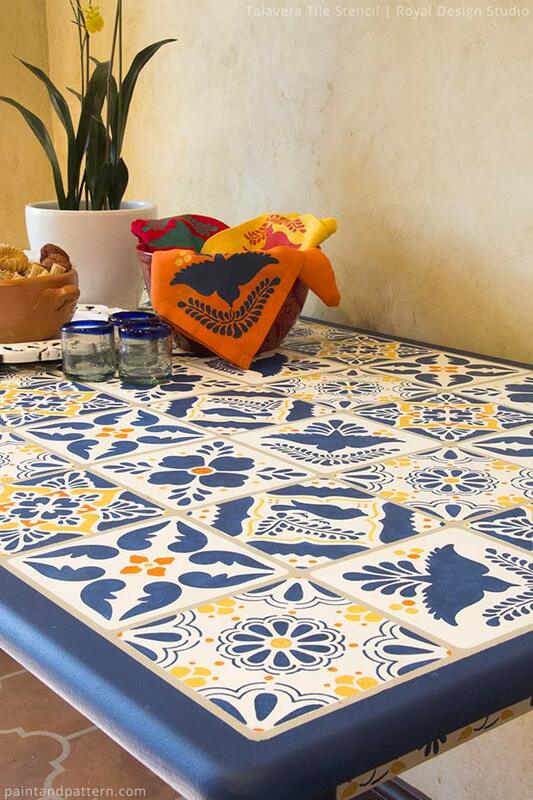 This popular DIY using our Talavera Tile Stencils shows you how to stencil your own faux tile table. Zero tile-laying experience required! What’s even better is you can follow this tutorial with any of our Tile Stencils to create any style you want! 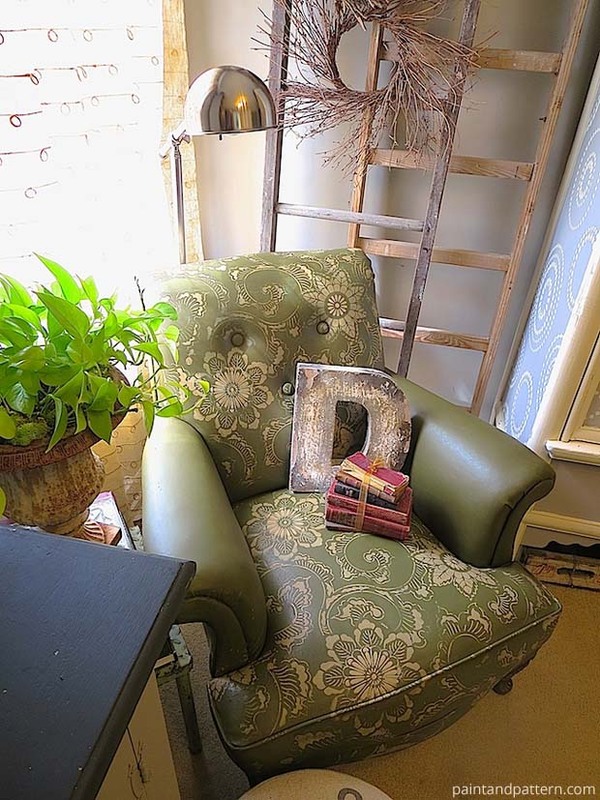 Stencil DIY: Leather Club Chair Goes Drab to Fab! Debbie Hayes of My Patch of Blue Sky wowed you again with not one, but TWO stenciled upholstery projects! Her most recent one walks you through easy-to-follow steps using our Kimono Allover Stencil and Chalk Paint® by Annie Sloan in Olive, Country Grey, and Old White. Everyone is also going nuts over this drab to fab DIY on Hometalk! And there you have it! We hope these Top 6 DIY stencil projects inspire you to create pretty patterned décor for your home this next year. Thank you for reading and supporting us during our first year here at Paint + Pattern. Stay tuned – there are more How To’s and Stencil Ideas to come! Don’t forget to share your DIY stencil projects! Email us at projects@royaldesignstudio.com or tag us on Instagram with #royaldesignstudio – maybe yours will be a 2015 customer favorite!